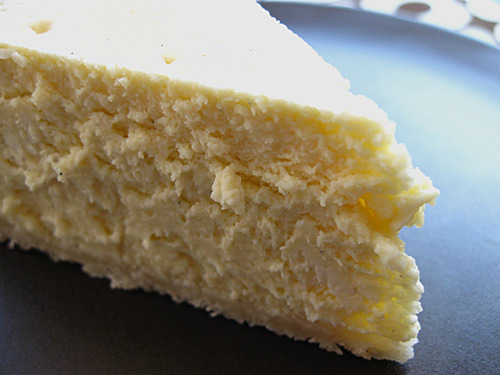 We made this without the ricotta and it came out ok, but it does add to the texture and creaminess. 1. For the crust: Preheat oven to 350 degrees F. Spray a 7 inch springform pan with cooking spray. In a medium bowl, combine the flour mix, xylitol (or sugar), cinnamon, ginger, salt, and xanthan gum. Add the chilled butter cubes and incorporate with a pastry cutter or your hands until crumbly. Add the vanilla and incorporate thoroughly. 2. Pour the crust dough into your pan (it will still be quite crumbly). Press the dough evenly along the bottom and approximately halfway up the sides of the pan. If needed, use a small glass with a flat bottom to help press the dough into place. Bake for 16-18 minutes, until lightly golden in color. Remove and cool on a rack. 3. Raise oven temperature to 475 degrees F.
4. For the filling: Add cream cheese and ricotta to the bowl of an electric mixer and beat until light and fluffy. Add the salt and xylitol. Continue to beat for 2-3 minutes. One at a time, add the eggs and beat until blended. Add vanilla bean paste and mix well. 5. Fill a saucepan with water and bring to a boil. Wrap the pan containing the cooled crust with aluminum foil, to prevent leakage in the water bath. Place the pan into a larger pan â€” a roasting pan works well â€” and pour filling into the springform pan. Place the roasting pan containing the cheesecake on the middle rack of your oven and slowly add the boiling water to the outer pan, filling until the water comes approximately 2/3 of the way up the side of the springform pan. 6. Bake for 8 minutes at 475 degrees F and lower the oven temperature to 350 degrees F. Continue to bake for 30-45 minutes, or until the center is still slightly jiggly but not set. Remove the springform pan from the water bath and cool on a rack. Refrigerate for at least 2 hours before serving.